Sayegh, who was an early supporter of Murphy’s, will be sworn-in as the city’s next mayor on Jul. 1. He touted his relationship with the governor and his lieutenant, Sheila Oliver, throughout the campaign. Oliver was one of Sayegh’s professors in college. She is expected to attend the inauguration event as well. Soon after winning a landslide victory, securing more votes than the second and third place finishers put together, Sayegh met with Murphy and other administration officials. 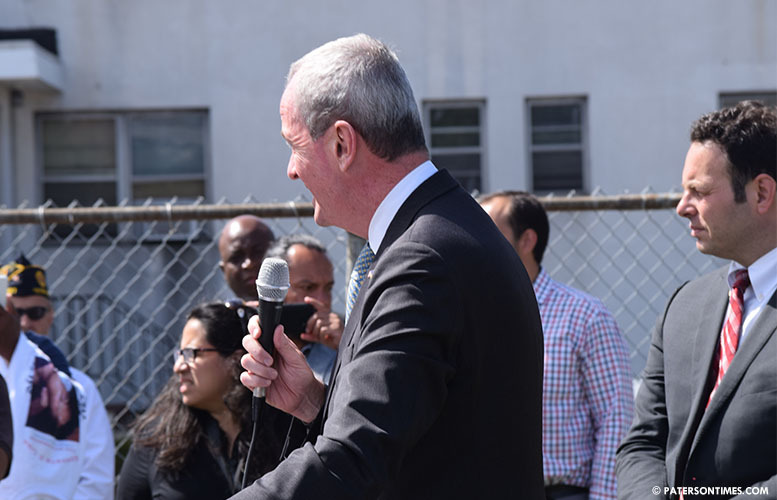 Murphy re-affirmed his promise to provide more resources to tackle the city’s chronic crime problem, according to officials who attended the meeting. Murphy visited Paterson multiple times while campaigning for governor. He promised to have Paterson’s back once elected governor. It isn’t clear whether this means more grants to hire police officers or a big increase in transitional aid. Oliver is head of the New Jersey Department of Community Affairs (DCA) which last year provided the city $27 million in state aid. The inaugural ceremony is scheduled to take place at International High School on Grand Street at 12 p.m.
Sayegh will be sworn-in as the city’s 47th mayor. He will be the city’s first Arab-American mayor. His wife, Farhanna, will be the city’s first Arab-American and Muslim first lady. Both have two daughters and a boy is on the way in Aug.
Maritza Davila, Flavio Rivera, and Lilisa Mimms will be sworn in as council members. Davila will begin her second four-year term while Rivera and Mimms will start their first. The governing body’s re-organization meeting is scheduled for 3 p.m. at City Hall on Market Street. Sayegh isn’t the first to have big hitters at his inauguration. Four years ago, ex-mayor Jose “Joey” Torres was sworn in by then-governor Chris Christie. Christie had to cut his visit short when members of the Paterson teachers’ union appeared at the event with signs and began to boo him. Teachers drowned out the then-governor with loud shouts of boos as he administered the oath of office to Torres. Christie was left with little choice but to depart early to avoid marring Torres’ celebration.